We are committed to redefining traditional hard cider, playing with interesting flavor combinations, fermentation and aging techniques in hopes of highlighting the cider apple and all the wonderful ways we ferment them. We are a true Midwestern Ma and Pa organization supported by passionate people we work and drink with. 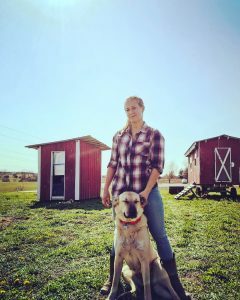 The company was founded in December 2013 when owners Jesse Narducci and Katie Greenfield moved back to the Heartland from California to bring their craft cider to their home state. The family farm now hosts over 700 young heirloom apple trees with varietals from all over the world. 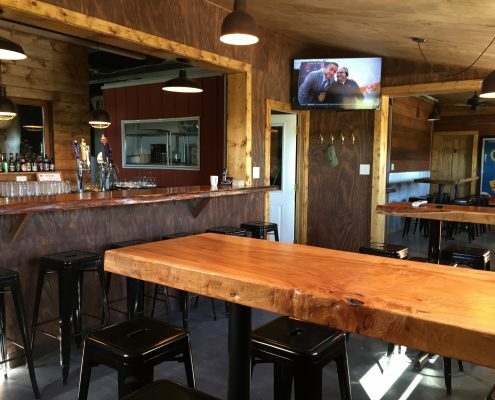 Jefferson County Ciderwork’s production facility and Tap Room are located just west of the family farm in a newly renovated old horse barn. Bright, crisp, citrus, semi-dry, and herbaceous. A cider that beer drinker’s can get behind. This is a dry, flavorful cider. Fermented with our house blend of yeast, this cider is aged on raw French oak for two weeks, while soaking in all the floral, herbal flavors from our blend of citrusy hops. To finish this cider, we back-sweeten with apple juice to round out the flavors and create that well-rounded dry taste. Boasting flavors of oak, stone fruit, whiskey, vanilla, tart cherry and crisp apple, this is a wine-like, semi-dry, big flavored cider. It is refreshing and rewarding to your tongue, drinks like a sour fruit beer or sparkling rosé. It is crisp, tart and smooth. We add lots Michigan Montmorency cherry juice on the backend of fermentation and age this cider on a toasted French oak, leaving behind a flavor that will linger from sip to sip. This cider is aged with loads of whole organic hibiscus petals, whole roses. Only oaked fir 3 days for minimal oak flavor in this cider. Its semi-dry. Hibiscus Rose is one of our driest. A wine like taste bursting with floral and earthy tannins. More please! Full of fruit flavors, bright pineapple sets the pace with a fresh apple taste right behind. Our Dry Pineapple cider is aged on French oak, which adds a buttery flavor that rounds out the pineapple. We have to highlight and give homage the apple in its simplest form. This is a semi-sweet cider aged on toasted French oak. Brite and refreshing, this cider is easy to drink and deeply satisfying. This is a bright cider infused with tangerine zest. Tart, bright, citrusy, and refreshing. A perfect balance of tangerine and apple. Simple and so tasty. Our lemon lavender hard cider tastes like a Midwest summer sunset. This is a simple apple cider with subtle herbal and citrus notes. We age this cider with the highest quality French lavender from Provence, France and top it off with lemon and apple juice to round out the acidity of the citrus. A nostalgic slice of Grandma’s pie in your glass… or if you’re from a Rural community, a sip of the ol’ moonshine- go on, we won’t tell. Tart, tangy, and slightly sweet. This cider is aged with whole vanilla beans, cinnamon and other spices. This blend is our longest aged cider to bring out deep aromatic spices and the flavor finishes out with a bright green apple. It is a semi-sweet cider and way too easy to drink – watch out! We created this blend of cranberry, aronia berry and orange cider to raise a glass with family and friends at the holiday table. It is a super juicy and jammy, semi sweet and full flavored, all things holiday cider. Our heritage holiday blend, aged on oak for months with spruce tips, spices and vanilla. This cider is pure holiday on the nose and tastes like winter. Our experimental, wild ferments and one-off cider projects are always in the works. We’re alway pushing the bar, and the idea of what cider is and what cider can be. From wild ferments, multiple yeast strains, aging techniques, flavors, spices and fruits. The Cellar Series Ciders are only available at our tap room and very select tap accounts. Follow us on Instagram and Facebook for updates and availability. Our very own mobile food trailer offering ‘New American Bar Food’, Midwest traditional eats mixed with unique twists collected from our background and travels. Innovative and mouthwatering specials are served daily. We work with the best ingredients we can, working with Midwest growers and purveyors as well as our own chef’s garden. Our daily specials and menu updates can be found on our Facebook. 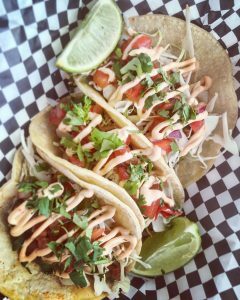 Our state of the art food trailer is 100% mobile and off the grid if need be, so talk with us about catering events or festivals! Open seasonally our Tap Room pours our JeffCo Cider, Craft Beer, NA Beverages… and all around good times. The Tap Room hosts around 40 seats inside and an infinite number on our country lawn – dotted with picnic tables, filled with happy children and parents alike. A true Midwestern community experience. Originally coined ‘Sunset Station’ by the founders, the Tap Room hosts the best views of the setting sun in Southeast Iowa. The Tap Room is available for corporate and private events. Contact info@jeffcocider.com for more information. Cider maker – Jesse Narducci is the head cidermaker and founder of Jefferson County Ciderworks. Beginning his career as a classically trained Chef at Le Cordon Bleu, Jesse worked in San Francisco as a chef and later bartender, when “craft cocktails” were blossoming. 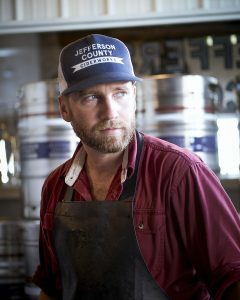 Jesse began brewing beer and making hard cider well over a decade ago. Fascinated with both traditional and unique fermentation techniques, blending varititals, and infusions of flavors. His ciders are always pushing the concept of what cider is. Jefferson County Ciderworks is an offspring of the family orchard, Jesse and the family began planting cider apple trees 10 years ago and the orchard now boasts 100+ heritage and heirloom varieties with 800+ trees – featuring unique apples from all over the world – even Iowa! Ciderworks is committed to the idea that cider is Iowa agriculture and continues to plant new orchards each year. Jesse’s cidermaking style comes from a mix of winemaking practices but some unique and fun techniques inspired from the beer industry as well. The cider company features many ciders, simple ciders like the “original apple” as well as interesting flavors lending from the craft cocktail and restaurant culture, with infusions of hibiscus rose and lemon lavender. Never truly leaving the heartland, each year Jesse would return to the Midwest, developing the family farm in Iowa. Katie Greenfield – Has a background in consulting. Katie saw a big need for backend organization and finance management for creative companies. Crafting her business and clients so she could always be part of the arts, working with companies in film, food, music, and fashion, Katie has stabilized, organized and helped grow businesses in Los Angeles, Oregon, and New York. Katie is the glue that holds ciderworks together. She helps with every aspect of the operation, bringing her real world business experience to the table and keeps the cider flowing. Also by far one of our best taste testers when new flavors are being created. Just west of Fairfield, first left off Brookville rd. 200th st. is the first gravel road.